Farro + Risotto = Farratto. A slow cooked, rich side dish for cozy fall days. The secret to this dish is the seeds. 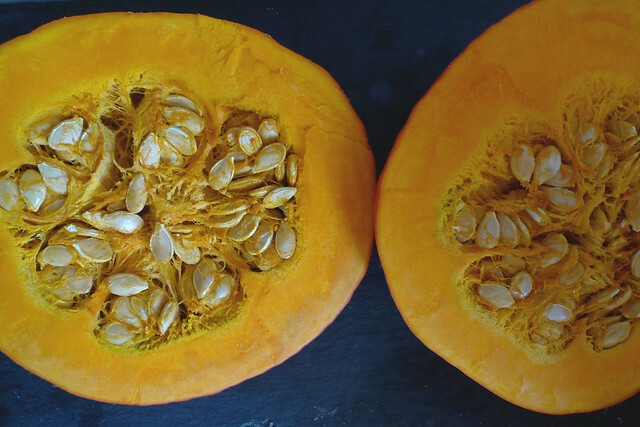 Squash seeds are packed with flavor. So instead of throwing the squash innards into the compost, I use them to make a rich buttery broth that's soaked up by the farro. Risottos take more care, the constant attention, the stirring. I'll be honest, this certainly isn't a weeknight dish. It's a dish for special occasions. It's a dish for feeding the people you love. For when you're asked to bring a side to Thanksgiving dinner. And for when you wouldn't mind overhearing, "Mmm, who brought this squash dish!" 1. Preheat the oven to 370 degrees. Cut the kabocha squash in half, or substitute any other winter sqaush or pumpkin you have on hand. (I just love the buttery pumpkin flavor of the kabocha.) I've found that a good trick to cutting open a squash is to put it in the oven while it is preheating, about 15 minutes. That way the skin starts to soften up and it is much easier to cut in half. Scoop out the seeds and set aside in a medium sized pot. Place the two sides of the squash face down on a baking sheet and cook for 30 minutes. Or until the squash is soft enough to put a fork in, but not squishy. 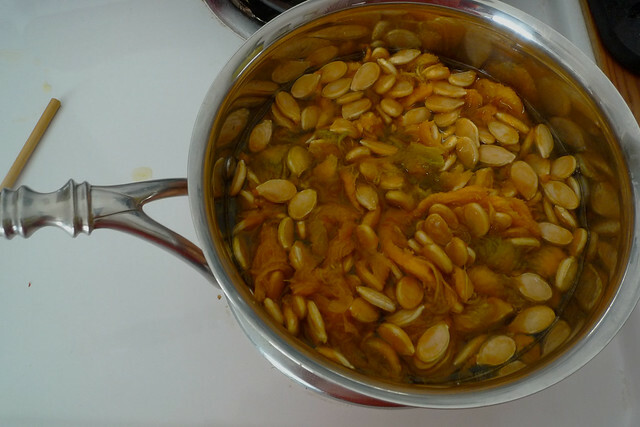 While the squash is cooking, cover the squash seeds with 6 cups of water and set over medium heat and allow to simmer until needed. The longer you simmer the more flavor is pulled from the seeds. 2. Now it's time to start the risotto. 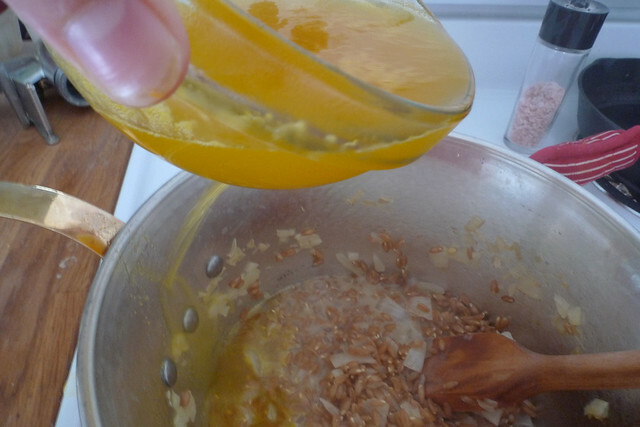 In a large pot or high walled skillet, melt the butter and saute the onions until they are translucent. Then add the farro and toast it in the remaining butter for about 2 minutes. Then add the white wine. 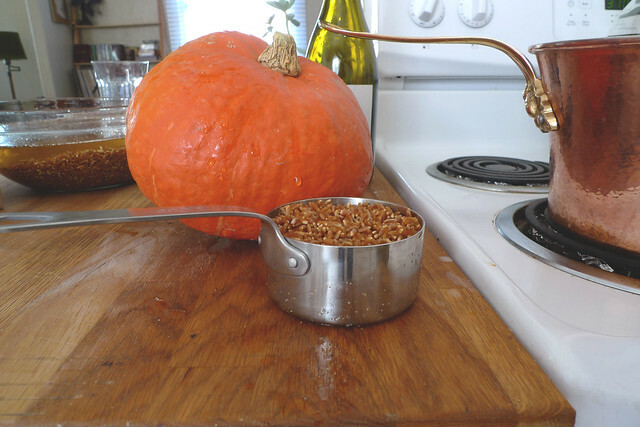 Stir frequently until the farro absorbs the liquid. 3. 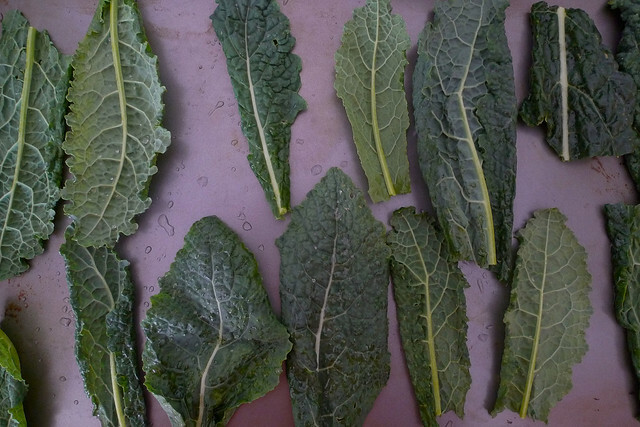 While the farro is soaking up the liquid, prepare the kale chips. Wash and dry the leaves, cut off the woody stems and spread them out on a baking tray. Brush each leaf with olive oil on both sides, dust with salt and pepper and bake for 10 minutes in the oven alongside the squash. Keep an eye on the kale, they are easy to burn! They are done, when you the leaves are stiff sheets, that easily crumble. 4. When the farro is saturated with broth, turn the burner to low heat. The squash should be cooked, out of the oven and slightly cool by now. Peel off the skin and chop it into 1 inch cubes. Add two cups to the farratto. (Depending on the size of your squash you might have some leftoever squash, it will keep in the fridge for a few days and you can puree it and add it to yout pancakes in the morning!). Stir in the squash, salt to taste and crumble in the kale chips right before it's served. 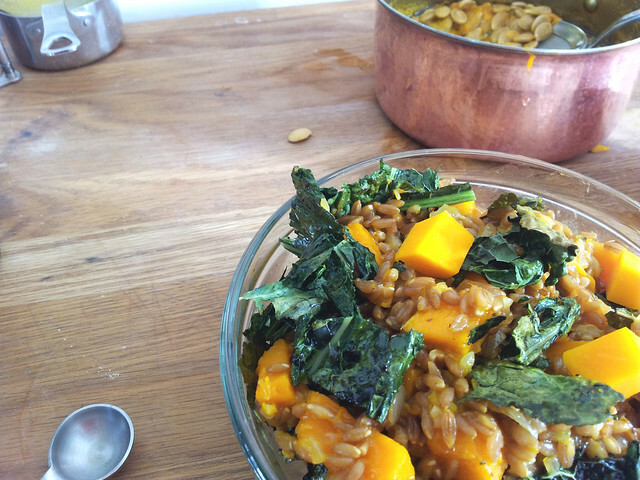 Posted on November 4, 2013 by Emma Zimmerman and filed under Dinner, Recipe and tagged Farro Berries 2013.